A strong crop of new point-and-shoot cameras is being introduced to Macworld Expo show-goers this year, including one high-end, high-speed model that's designed for sports photographers and other shooters who need to capture just the right image at just the right instant. And when you need to print that perfect shot—whether it's from a high-end point-and-shoot or your trusty digital SLR—you have two new output choices: HP and Epson are competing head-to-head with two new and identically priced photo printers. Canon's quartet of new point-and-shoots demonstrate that the company is serious about moving its image-stabilization (IS) technology down into the more-affordable end of its consumer line. All four new cameras have Canon's new Digic III image processor, and all but the top of the line can capture JPEG-only images at up to ISO 1600. When I pressed a Canon spokesperson about the quality of images taken at that high an ISO setting, he said "Being able to get the shot is better than not being able to get the shot—but is there some noise in it? Sure." We'll see exactly how much noise he was talking about when Macworld gets these new units in for review. Among these new image-stabilized cameras, the entry-level PowerShot SX100 IS lists for just $299, and features an 8-megapixel CCD, 10X optical zoom, a 2.5-inch LCD, and a 6.0-60mm, f/2.8-4.3 lens with a 35mm film equivalent of 36-360mm. If that's not quite enough camera for you, another $50 will get you either an 8-megapixel PowerShot SD870 IS or a 12.1-megapixel PowerShot A650 IS. The SD870 has a 3.8X optical zoom, a large and bright 3.0-inch LCD display, and a 4.6-17.3mm, f/2.8-5.8 lens with a 35mm film equivalent of 28-105mm. The A650—the new top dog in Canon's A line—has a smaller 2.5-inch LCD, but it's mounted on a swiveling extension to allow you to hold the camera above your heads to more easily capture shots of, say, the line you're waiting in for next year's Expo Keynote. The A650 also has a 6X optical zoom and a 7.4-44.4mm, f/2.8-4.8 lens with a 35mm film equivalent of 35-210mm. It may not have the SD870's wide-angle capabilities, but the A650's other advantages—including the option of full manual control over shutter and aperture—make it seem a better choice for the more-serious photographer. 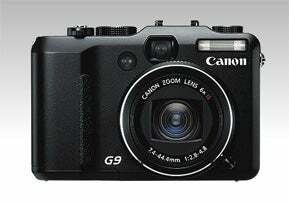 The new top-end model in Canon's point-and-shoot line is the 12.1-megapixel G9. This rugged, all-metal $499 number seems designed to be an SLR photographer's second camera—one that won't intimidate folks when it's pulled out at family gatherings like a big ol' speedlight-equipped SLR might (just ask my camera-shy mom). Unlike the other three new point-and-shoots, the G9 can shoot in RAW mode and at ISO settings up to 3200. The earlier noise caveat still applies, but since the G9's image sensor is larger than those in the other three, noise should be less of a problem. The G9 has a 6.0X optical zoom, can shoot in a 16:9 aspect ratio, includes a bright 3.0-inch LCD display, and has a 7.4-44.4mm, f/2.8-4.8 lens with a 35mm film equivalent of 35-210mm. Being designed to be a pro's second camera, it can, of course, shoot in all modes from full-automatic to full-manual. Unlike the other new Canons, it also includes a hot shoe that will work in full TTL mode with Canon's speedlights, though "probably" only in manual mode with speedlights from other manufacturers, according to the Canon spokesperson. (No luck with my Nikon SB-800. Sigh...) The G9 feels good in the hand, and its specs are impressive—for five hundred bucks, it should be a good investment. Although they were pioneers in the digital-camera space 'way back in the early 1990s, Casio isn't currently known for superior products—but that might change when their EX-F1 ships in March. This $999 handful can shoot 6-megapixel images at the breathtaking rate of—wait for it-60 frames per second. Alternatively, you can dial the rate back to, say 20 frames per second and shoot three seconds worth of images before you need to flush the buffer to the camera's SD card—a process that the Casio rep told me should take about 10 seconds, but who also readily admitted that since the camera is only in prototype phase, that figure was "totally made up." After you've shot your 60 images and before you write them to the card, you can play them back on an exceptionally bright 2.8-inch "Super Clear LCD," pick the ones you want to save, and discard the rest. There's no refocusing during the image-capture burst—which is perfectly reasonable—and the built-in flash can keep firing for 20 shots at seven frames per second. Oh, and did I mention that it also captures 1080i HD video? Being an amateur sports photographer, I'm dying to try this puppy out. Less Wow! but still of interest are two new Casio point-and-shoots: the 8-megapixel, $199 EX-Z80 and the 10-megapixel, $249 EX-S10. The most interesting feature of both is their ability to capture H.264 video (in .MOV files) and AAC audio, so their video output is immediately Mac-friendly. Both can capture that video in either a widescreen 848-by-480 pixel format or a more conventional 648-by-480 pixel format. The EX-S10 is blessed with the same Super Clear LCD as the EX-F1 (with a claimed 1000:1 contrast ratio and 1000-candela brightness, it's quite impressive); the EX-Z80 has a plain vanilla 2.6 LCD. Oh, and sadly, the Z80's name isn't in honor of the pioneering microprocessor of yore. For we manly men (ahem...) there's nothing quite like a heavyweight fight, when two bruisers come out swinging and only one emerging triumphant. Well, Epson and HP took the gloves off at this year's Expo and introduced dueling photo printers, both listing for $549.99 and both designed for the high-end amateur photographer. Macworld contributor Rick LePage thoroughly covered the Epson Stylus Photo R1900 in a Creative Notes blog last week—read it for a comprehensive overview of Epson's contender. I'll limit my comments to HP's new Photosmart Pro B8850 which is schedule to be in stores in mid-April. 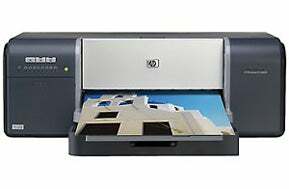 According to an HP spokesperson, the B8850 is the latest step in the company's effort to "bring pigment-ink printers down to the advanced-amateur market"—advanced amateurs being those of us who shoot with digital SLRs and manipulate our photos in Photoshop or Aperture. Pigment-based inks, as you may know, have some advantages over the dye-based inks used in most inkjet printers, such as a wider range of possible media types and much longer-life images—the HP spokesperson claimed 200 years, but neither he nor I will be around to find out, and nothing I've yet shot deserves to live that long. The knock on pigment-based inks has always been that the range of colors they can produce—their gamut—has always been constricted when compared to dye. According to the HP rep, however, their company's pigment-based ink's gamut is "coming up to dye"—and the samples he showed me were, indeed, quite impressive. Among what I saw coming out of the B8850, I was particularly impressed by the quality of the black and white images. The greys were subtle, the gradations were smooth, and there was no discernible color cast, thanks in part to the B8850's eight-ink technology, which includes matte black, photo black, and grey. Another aspect of the B8850's technology that at least sounds impressive when described, but which I had no way to test, is its "electrostatic drop detection," which monitors each individual printer nozzle, checking for clogs. When it detects a clog, it then switches that nozzle's duties to another nozzle, and during the cleaning cycle cleans only the clogged nozzles. Theoretically, this technology should not only prevent missing lines in images, but also allow for more-efficient nozzle cleaning. I scrutinized images from both the Epson Stylus Photo R1900 and the HP Photosmart Pro B8850, but only individually and not side-by-side—and, of course, the only images I saw were those chosen by each manufacturer to best showcase their printer's abilities. They both looked pretty damn good for $549 printers; I look forward to an upcoming Macworld review to see which heavyweight takes the crown. When we meet again after Thursday at Expo: hard drives, RAID units, and other storage, from pocket portables to enterprise-class behemoths.